Insights from an advanced technology engineer. Smart Industry: You have an interesting title—advanced technology engineer. Ryan: The moniker comes from the fact that we have integrated the most advanced technology TRUMPF has to offer into the Smart Factory. On the hardware side, this is reflective in the machine-selection and also the automation that connects them. On the software side, this includes intelligent front-end order processing, networked programming software, and tracking software that shows the consumption of material and the status of customer orders. My job is to be able to provide application solutions utilizing these technologies and to show customers the benefits of what we have here at the facility. Smart Industry: Describe your background / education. established along with the many skills learned running one’s own business. Over the years I supplemented my education taking CAD/CAM courses. All of my training in sheet-metal design and production has been provided through TRUMPF’s excellent educational resources and senior application staff. I have been here for five years. Addressing and meeting customer needs is an educational experience in and of itself. Being able to understand and respond with solutions for custom applications keeps me on my toes. Smart Industry: How is your approach different with these machines than with previous equipment? Ryan: During my time in applications, I worked with CO2 and fiber 2D flatbed lasers and 3D tube lasers. Currently I have the privilege to be the first U.S. application engineer working on TRUMPF’s TruLaser Center 7030. This machine completely redesigns the way we approach sheet-metal fabrication. It’s a fully automated system that integrates part-sorting and removal into the production process, increasing throughput times. The operator loads full sheets into the TruLaser Center 7030 for processing, and then uses automation to remove and sort the parts. The main difference in the way I have approached this machine is by using the previous technologies I’ve worked with as reference points, understanding the similarities and then adapting to the new features. I also work closely with my colleagues in development (both in the US and Germany, TUMPF’s base) as we prepare to bring this machine to the North American market. The collaborative process has been extremely rewarding. Smart Industry: How do you interact with these machines? Ryan: Once we acquire a job from a customer, I convert any needed files, create nesting, and process the NC program for the laser. Once the material is loaded, I check the first few parts for optimal edge quality and continue monitoring the material processing. Sometimes a customer will ask us to test special materials, create custom technology tables and send samples. Examples of the special materials would be pre-painted material, diamond plate, laminated mica, and specialty-hardened materials. We also create time studies to assist our customers in seeing the benefits of machine-technology advancements. Smart Industry: Is there a misconception about working in the modern manufacturing space? Ryan: Working in manufacturing is an honorable trade. I have the utmost respect for any worker in any country taking pride in their craft and the results. The customers we provide solutions for are an extension of ourselves as a manufacturer. I think as a society we have placed higher value in endeavors other than manufacturing. While this has created a skills gap, it has also created an opportunity for a new generation of manufacturing talent to come in. This is an excellent time to be part of modern technology as it advances to meet the demands of industry. Smart Industry: What is the appeal in working with smart technology / advanced machinery? Ryan: I appreciate the challenge. I also want to be able to ensure a smooth transition for our customers who are ready to put their continued faith into our solutions. I keep in mind that advanced technology will eventually just be considered “technology,” and I like the idea of being on the front-end of that shift. Smart Industry: What is something unusual about the TRUMPF Smart Factory. Ryan: The Smart Factory exterior is clad in COR-TEN steel, which is developed to eliminate the need for painting and forms a stable, rust-like appearance. To me it’s a very handsome look, but it’s always funny going out to lunch and having someone recognize the TRUMPF logo on my shirt and ask me why we forgot to paint the building. Want to see the TRUMPF Smart Factory? 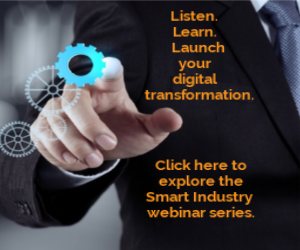 Take the tour during the 2018 Smart Industry Conference. Click here to learn more.